Distribute and share our brochure! The Mission of the Children of the Sun school projects are to provide an education to children between the ages of 8 and 16 years, who lack economic resources. We will provide an education that allows them to acquire particular training that will prepare them to face the rest of their lives in a successful manner, and one that will assist them in supporting their Andean-Amazonian culture. The foundation will focus on children from the Aymara, Quechua, and Amazonian regions in South America, during its initial phase. The focus of the second phase will be to extend this program to other Indigenous groups. The distinctive feature of this education will incorporate the ancestral education of the native Aymara, Quechuas, and Amazonian peoples with contemporary, technological education. Our goal is to teach healthy sustainable living with a local and world view using modern educational techniques. We plan to have young children self sufficient in in a sustainable local indigenous environment. January 2006, Sustainable Workshops with Village Earth, Peruvian Amazon. Work on first sustainable school started. November 2006, Our official Foundation status is complete in USA. January 2007, Sustainable Workshops with Village Earth, Peruivan Amazon. Teaching the teachers and leaders. 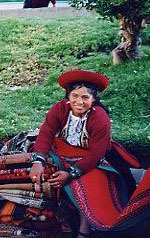 July 2007, Shipibo Tribe Unification Completed. Through the guided work of Village Earth, the Shipibo tribe was united. An organizational structure was set up for legal representation.